Mix all the ingredients wheat flour , cracked wheat , black pepper powder, cumin seeds ,salt ,sour curd and add some water to make into a thin batter . Keep aside. Heat a non-stick pan .Pour a ladleful of the batter and quickly spread into a circle. Spread little oil around the dosa and leave it for some time to cook.Allow it to get brown on one side. 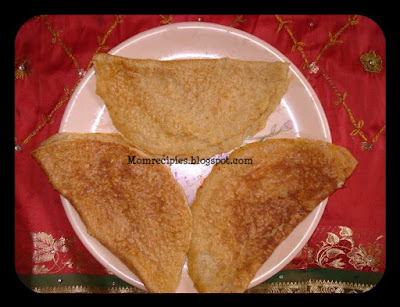 Then flip the dosa over and let it cook other side too for some time again. Remove the dosa from the pan and transfer to a serving plate. Serve hot with desired chutney and sambar. If dosas are breaking cover the pan and cook. Love this disa, mom used to make them when we came back from our school. Awesome! I would love to try this using Kamut Khorasan Wheat! Our family just loves the stuff - it has all kinds of vitamins and minerals and is so healthy. Anyway, this looks like a must try - thanks!